In a dystopian, post-apocalyptic future, humanity and civilisation has been destroyed and one particular society is governed cruelly by cult leader King Immortan Joe. After being captured by Joe and his army of War Boys, Max (Tom Hardy) is used as a blood bank for the injured War Boy Nux (Nicholas Hoult). Meanwhile, Imperator Furiosa (Charlize Theron) rescues Joe's five wives and attempts to flee the Citadel where they are held, causing Immortan Joe and all of his War Boys, including Max strapped to Nux's vehicle, to follow in pursuit across the desert wasteland to recapture his wives. Having not seen any of the previous entries in the Mad Max franchise, I wasn't entirely sure what to expect from Fury Road. The trailers made the film look, well, utterly insane, but we live in an age now where a lot of the time the trailers are more exciting than the films they promote (Yes, Age of Utron, I'm looking at you). Thankfully, though, Fury Road comes out firing on all cylinders from the get-go, and scarcely slows down for breathing room. But, somehow, director and writer George Miller (who crafted the original trilogy too) has packed this reboot with a surprising amount of narrative heft and emotional depth, with a completely unique visual style. Fury Road is unlike any film I have ever seen before, and one I already cannot wait to revisit again and again. It is likely I'm going to run out of superlatives for this one. Fury Road is a great reminder of how blockbusters can be inspired and insightful, and how, when created intelligently, they can be something truly special. This fourth installment is a visionary take on how to construct an action film, and one that slaughters any other film of this genre I can name. Trust me when I say that in years time, this will be a genre classic. 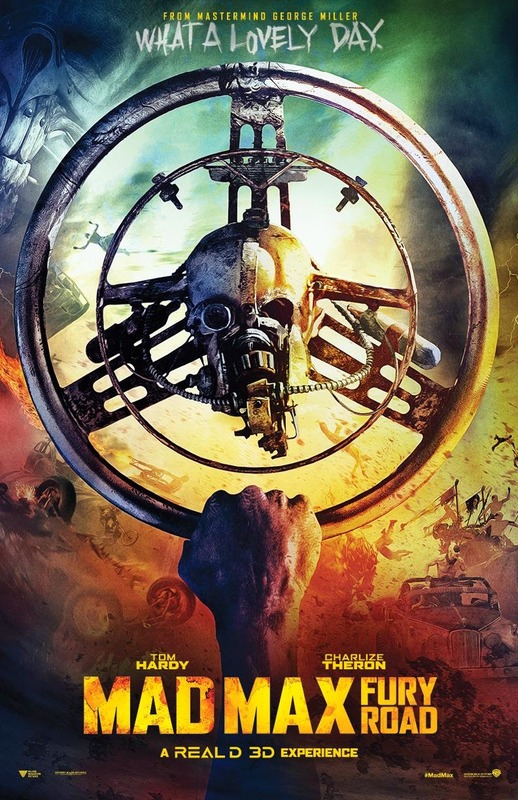 So rarely are we treated to a film that is as innovative as it is thrilling, but Fury Road ticks every box on the list. Its soundtrack is phenomenal too, an effortless blend of loud crashing drums and heart-stopping electrical pieces, all stylized into a sort of unique rock style. The chase sequences (by which I mean the entire film) are intense enough as it is, but the soundtrack boosts everything to another level. What struck me most about Fury Road, though, is how breathtakingly refreshing it is. Even amidst the extraordinary scale of the film's action, there is a perfect amount of narrative weight to keep us compelled by what is happening. Despite a severe lack of dialogue (which somehow works in the film's favour), these characters still feel fully fleshed out and real. It isn't difficult to buy into Miller's depiction of this dystopian future, and every detail feels right within the film's tone. By the time we reach the final act (ultimately the film's best sequence, I'm fairly sure the entire audience stopped breathing), there is an astronomically vast amount at stake, something that most action films tend to forget nowadays. Fury Road buys us into the characters and the story so subtly that we frequently don't realise how much we care for certain characters until something bad happens to them. Fury Road also excels visually, mostly due to the knowledge that roughly 80% of these stunts weren't achieved through CGI. The film has a distinct visual tone that sticks entirely, and never feels phony or lacking in any respect. The appearance of the War Boys finds the perfect balance between frightening and pitiful, allowing us to feel invested in the conceived "bad guys" as well as the characters we are actually rooting for. Fury Road also succeeds thematically, offering the simple tales of survival and redemption and seeding them within the action sequences. There are ideas and moments in the film that are truly horrifying, but rather than explain them and load the film with dull exposition, Miller just offers them as support as to how fleshed out this dystopia is. Not one ounce of the film feels misplaced, and it all comes together seamlessly to create the most visually and thematically thrilling film in years. Fury Road is a masterful achievement; an action film so rooted in ideas and concepts, but never forgetting to offer what every good action film must. There's been so much to say about this film that I only have brief time to skim over how superb the performances are; Hardy, Theron and Hoult are all excellent here, demonstrating how easy it can be when you have a good script to take you along. Miller's fourth installment will be a classic in the years to come, it is a breathtaking experience that boasts everything you could want from an action film and a hell of a lot more. The film so rarely slows down that by the time it finishes you'll struggle to have the energy to stand, it is simply exhausting. Filled to the brim with sublime action choreography and sheer vehicular carnage yet never forgetting its roots, Fury Road is a masterpiece. What a lovely day, indeed. To Summarise: Thematically rich, and supported by a perfect blend of narrative depth and emotional power, Mad Max: Fury Road is a genre classic in the waiting; well performed, visually stunning and simply thrilling. An utter triumph.